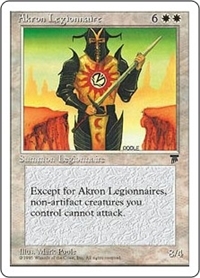 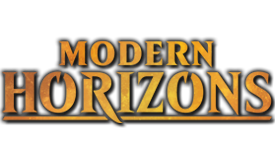 Except for creatures named Akron Legionnaire and artifact creatures, creatures you control can't attack. 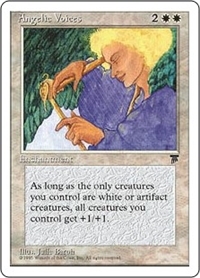 Creatures you control get +1/+1 as long as you control no nonartifact, nonwhite creatures. 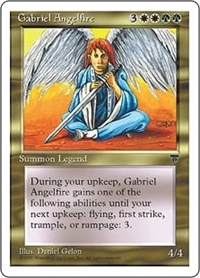 At the beginning of your upkeep, sacrifice Arcades Sabboth unless you pay GWU. 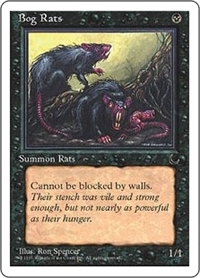 Each untapped creature you control gets +0/+2 as long as it's not attacking. 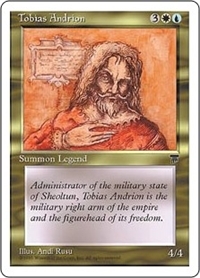 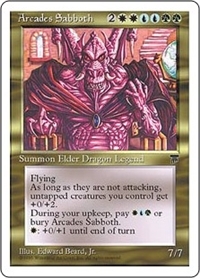 W: Arcades Sabboth gets +0/+1 until end of turn. 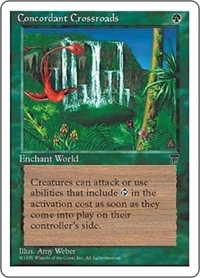 Legendary creatures don't untap during their controllers' untap steps. 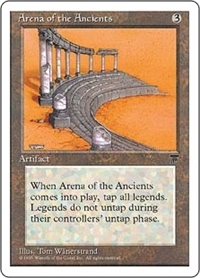 When Arena of the Ancients enters the battlefield, tap all legendary creatures. 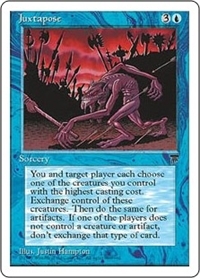 Argothian Pixies can't be blocked by artifact creatures. 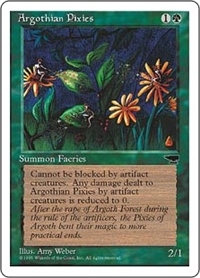 Prevent all damage that would be dealt to Argothian Pixies by artifact creatures. 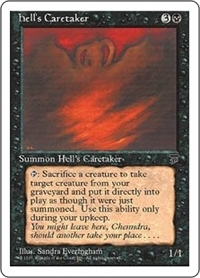 Sacrifice a creature: Add CC. 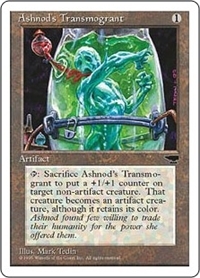 T, Sacrifice Ashnod's Transmogrant: Put a +1/+1 counter on target nonartifact creature. 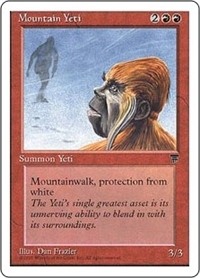 That creature becomes an artifact in addition to its other types. 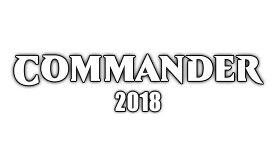 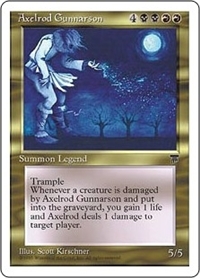 Whenever a creature dealt damage by Axelrod Gunnarson this turn dies, you gain 1 life and Axelrod deals 1 damage to target player or planeswalker. 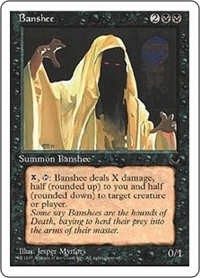 X, T: Banshee deals half X damage, rounded down, to any target, and half X damage, rounded up, to you. 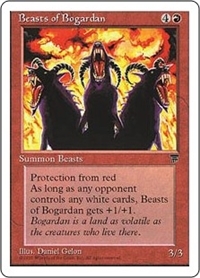 Beasts of Bogardan gets +1/+1 as long as an opponent controls a nontoken white permanent. 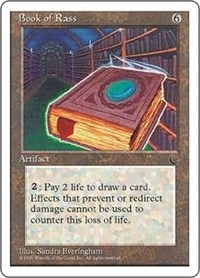 2, Pay 2 life: Draw a card. 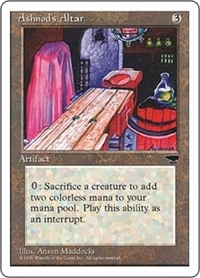 At the beginning of your upkeep, sacrifice Chromium unless you pay WUB. 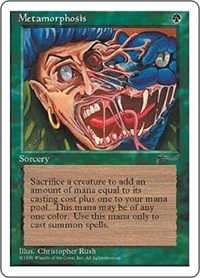 When Cocoon enters the battlefield, tap enchanted creature and put three pupa counters on Cocoon. 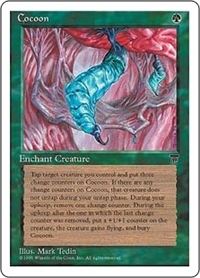 Enchanted creature doesn't untap during your untap step if Cocoon has a pupa counter on it. 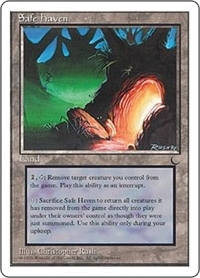 At the beginning of your upkeep, remove a pupa counter from Cocoon. 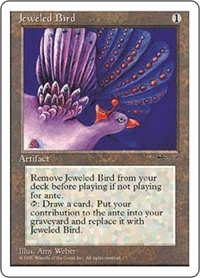 If you can't, sacrifice it, put a +1/+1 counter on enchanted creature, and that creature gains flying. 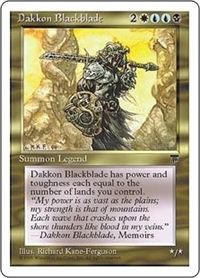 Dakkon Blackblade's power and toughness are each equal to the number of lands you control. 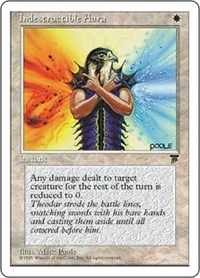 When Dance of Many enters the battlefield, create a token that's a copy of target nontoken creature. 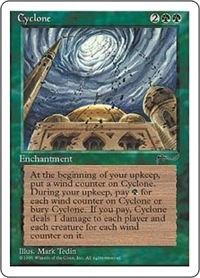 When Dance of Many leaves the battlefield, exile the token. 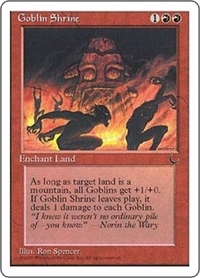 When the token leaves the battlefield, sacrifice Dance of Many. 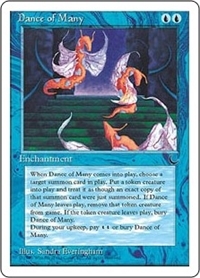 At the beginning of your upkeep, sacrifice Dance of Many unless you pay UU. 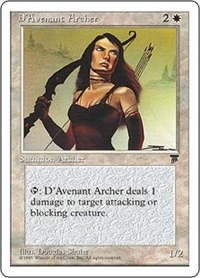 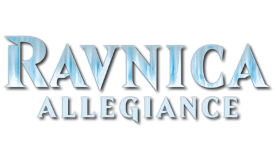 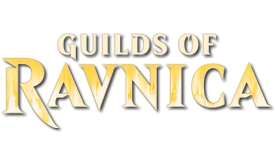 T: D'Avenant Archer deals 1 damage to target attacking or blocking creature. 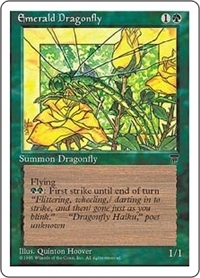 GG: Emerald Dragonfly gains first strike until end of turn. 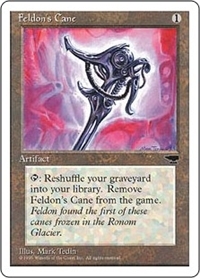 T, Exile Feldon's Cane: Shuffle your graveyard into your library. 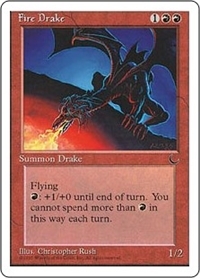 R: Fire Drake gets +1/+0 until end of turn. 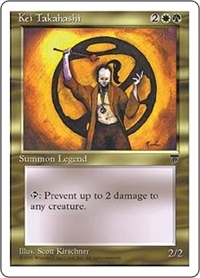 Activate this ability only once each turn. 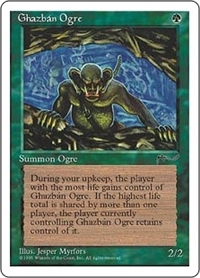 2, T: You gain 1 life. 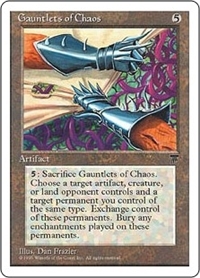 5, Sacrifice Gauntlets of Chaos: Exchange control of target artifact, creature, or land you control and target permanent an opponent controls that shares one of those types with it. 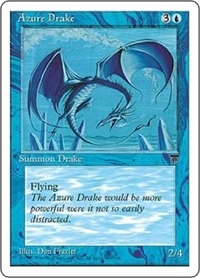 If those permanents are exchanged this way, destroy all Auras attached to them. 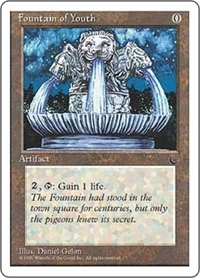 T: Flip a coin. 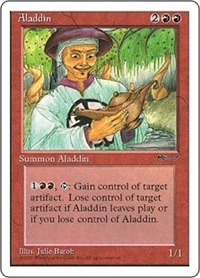 If you win the flip, draw a card. 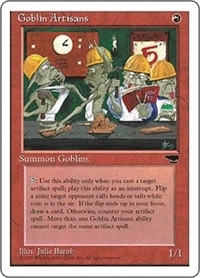 If you lose the flip, counter target artifact spell you control that isn't the target of an ability from another creature named Goblin Artisans. 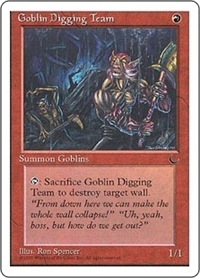 T, Sacrifice Goblin Digging Team: Destroy target Wall. 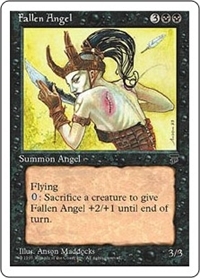 T, Sacrifice a creature: Return target creature card from your graveyard to the battlefield. 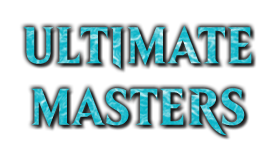 Activate this ability only during your upkeep. 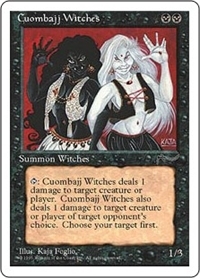 2, T: Prevent all combat damage that would be dealt by target creature this turn. 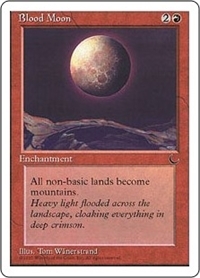 Prevent all damage that would be dealt to target creature this turn. 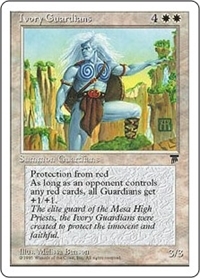 Creatures named Ivory Guardians get +1/+1 as long as an opponent controls a nontoken red permanent. 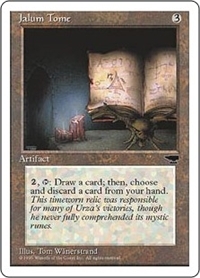 2, T: Draw a card, then discard a card. 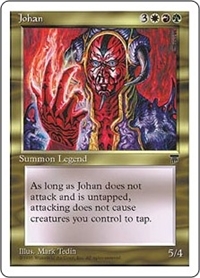 At the beginning of combat on your turn, you may have Johan gain "Johan can't attack" until end of combat. 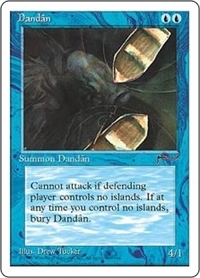 If you do, attacking doesn't cause creatures you control to tap this combat if Johan is untapped. 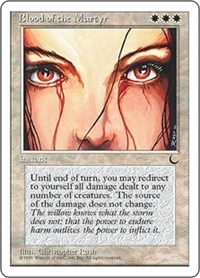 T: Prevent the next 2 damage that would be dealt to target creature this turn. 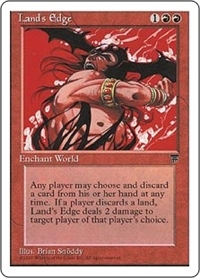 Discard a card: If the discarded card was a land card, Land's Edge deals 2 damage to target player or planeswalker. 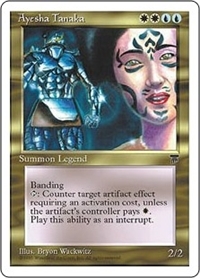 Any player may activate this ability. 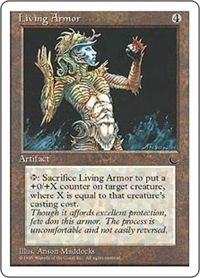 T, Sacrifice Living Armor: Put X +0/+1 counters on target creature, where X is that creature's converted mana cost. 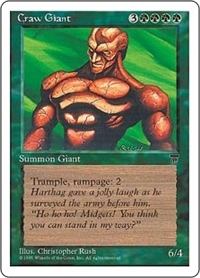 X, T: Choose a card name. 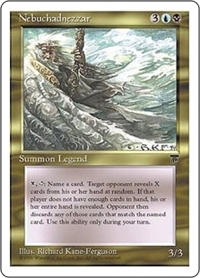 Target opponent reveals X cards at random from their hand. 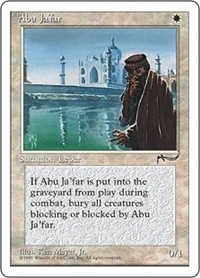 Then that player discards all cards with that name revealed this way. 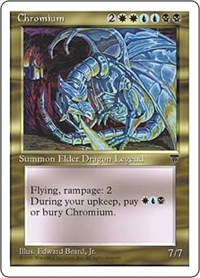 Activate this ability only during your turn. 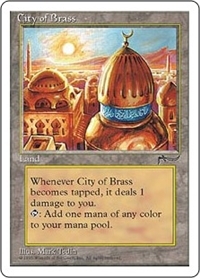 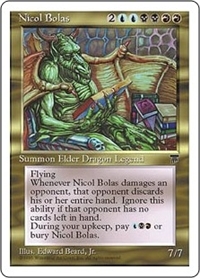 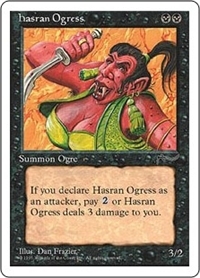 At the beginning of your upkeep, sacrifice Nicol Bolas unless you pay UBR. 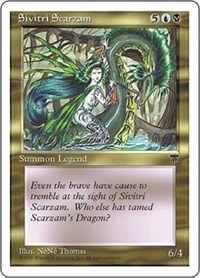 Whenever Nicol Bolas deals damage to an opponent, that player discards their hand. 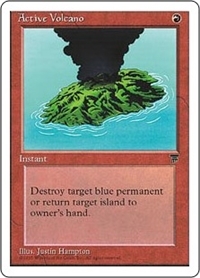 6, T: Return target permanent you both own and control to your hand. 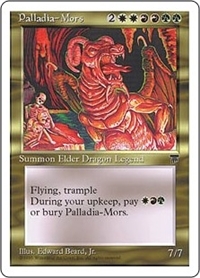 At the beginning of your upkeep, sacrifice Palladia-Mors unless you pay RGW. 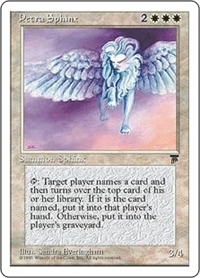 T: Target player chooses a card name, then reveals the top card of their library. 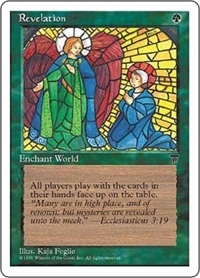 If that card has the chosen name, that player puts it into their hand. 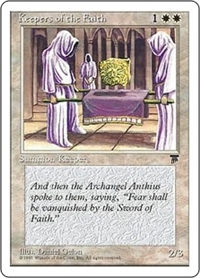 If it doesn't, the player puts it into their graveyard. 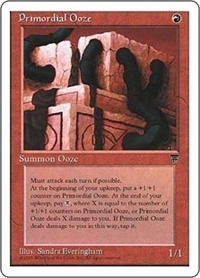 Primordial Ooze attacks each combat if able. 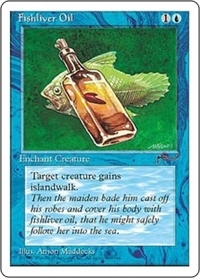 At the beginning of your upkeep, put a +1/+1 counter on Primordial Ooze. 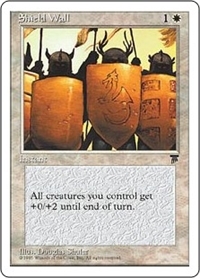 Then you may pay X, where X is the number of +1/+1 counters on it. 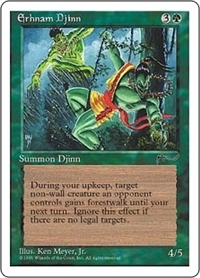 If you don't, tap Primordial Ooze and it deals X damage to you. 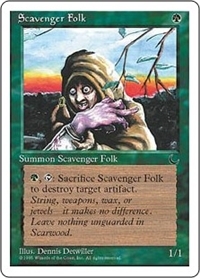 When enchanted creature dies, return that card to its owner's hand. 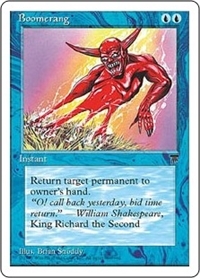 If that card is returned to its owner's hand this way, you may pay UUU. 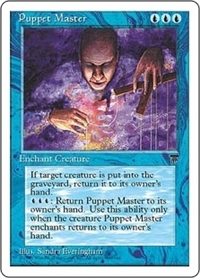 If you do, return Puppet Master to its owner's hand. 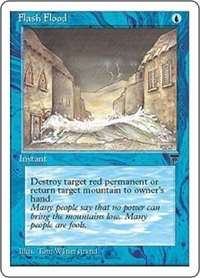 2: Prevent the next 1 damage that would be dealt to any target this turn. 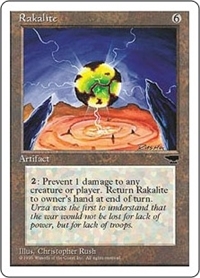 Return Rakalite to its owner's hand at the beginning of the next end step. 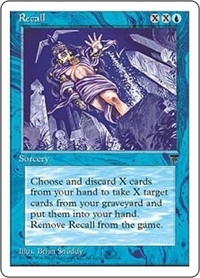 Discard X cards, then return a card from your graveyard to your hand for each card discarded this way. 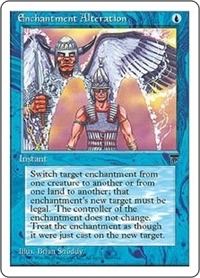 Exile Recall. 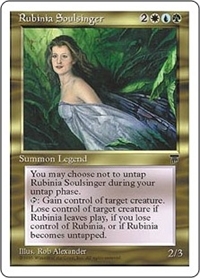 You may choose not to untap Rubinia Soulsinger during your untap step. 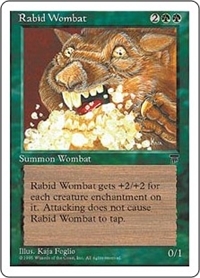 T: Gain control of target creature for as long as you control Rubinia and Rubinia remains tapped. 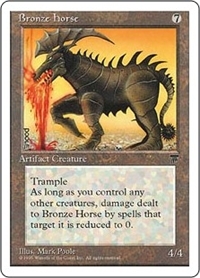 3, T: Target attacking creature gets +2/+0 until end of turn. 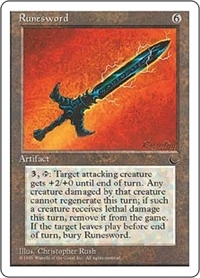 When that creature leaves the battlefield this turn, sacrifice Runesword. 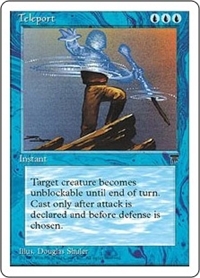 If the creature deals damage to a creature this turn, the creature dealt damage can't be regenerated this turn. 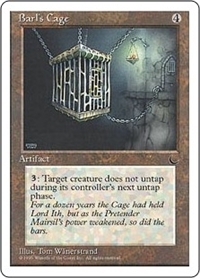 If a creature dealt damage by the targeted creature would die this turn, exile that creature instead. 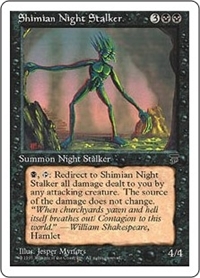 B, T: All damage that would be dealt to you this turn by target attacking creature is dealt to Shimian Night Stalker instead. 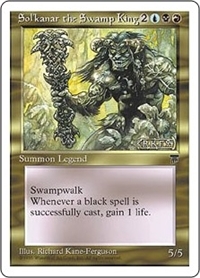 Whenever a player casts a black spell, you gain 1 life. 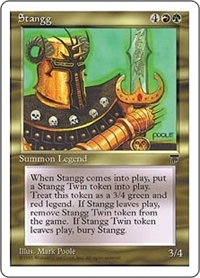 When Stangg enters the battlefield, create a legendary 3/4 red and green Human Warrior creature token named Stangg Twin. 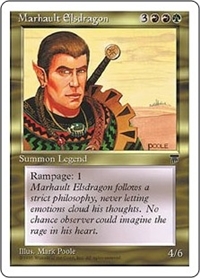 Exile that token when Stangg leaves the battlefield. 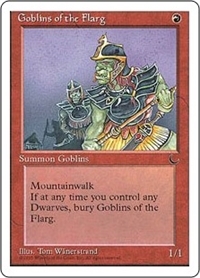 Sacrifice Stangg when that token leaves the battlefield. 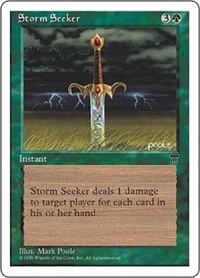 Storm Seeker deals damage to target player equal to the number of cards in that player's hand. 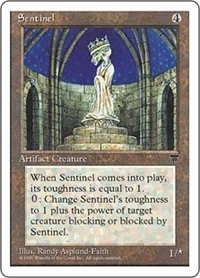 At the beginning of the upkeep of enchanted creature's controller, put a -0/-1 counter on that creature. 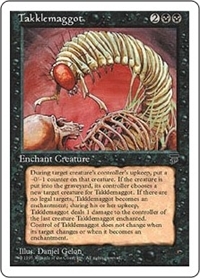 When enchanted creature dies, that creature's controller chooses a creature that Takklemaggot could enchant. 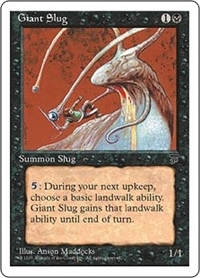 If the player does, return Takklemaggot to the battlefield under your control attached to that creature. 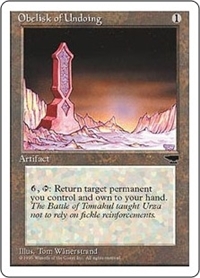 If they don't, return Takklemaggot to the battlefield under your control as a non-Aura enchantment. 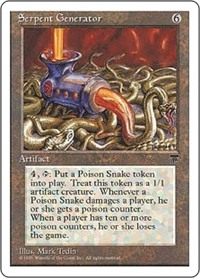 It loses "enchant creature" and gains "At the beginning of that player's upkeep, Takklemaggot deals 1 damage to that player." 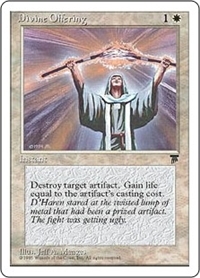 Cast this spell only during the declare attackers step. 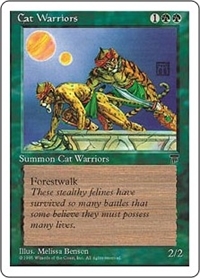 Target creature can't be blocked this turn. 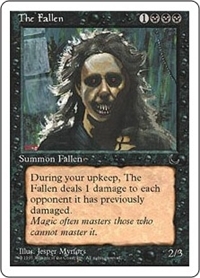 At the beginning of your upkeep, The Fallen deals 1 damage to each opponent and planeswalker it has dealt damage to this game. 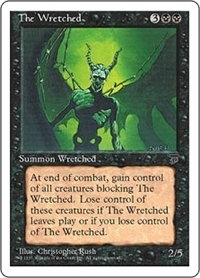 At end of combat, gain control of all creatures blocking The Wretched for as long as you control The Wretched. 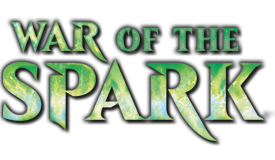 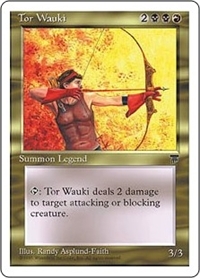 T: Tor Wauki deals 2 damage to target attacking or blocking creature. 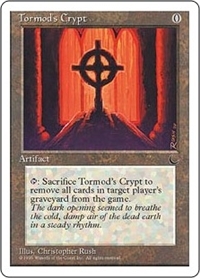 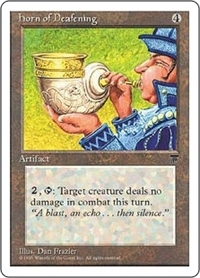 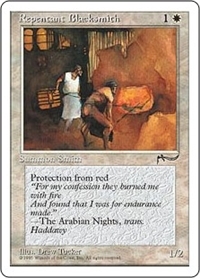 T, Sacrifice Tormod's Crypt: Exile all cards from target player's graveyard.